Press Note : A Love tale of star Heroine and a Normal Guy! 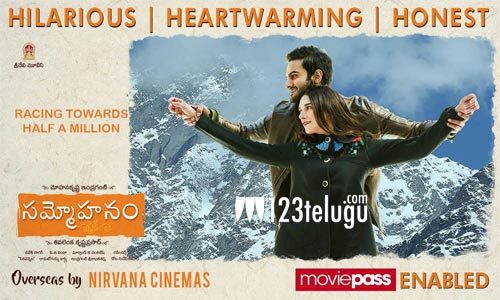 True to its meaning, Sammohanam is just that, mesmerizing and yet relatable in equal measure. If there are two genres that the Telugu film industry does it better than anyone else, when they get it right, it is comedy and romance and Sammohanam is one such gem of a movie where these two genres are exploited to the core. It is beautifully written by Indraganti who manages to extract just enough drama from keeping it real, honest and relatable to keep you constantly engaged and invested in the journey of the lead pair exceptionally performed by both Sudheer and Aditi. Aditi’s subtle expressions are so believable that everyone starts travelling with the role. Such a gem of an artist and she is here to stay. Special mention should go to veteran actor Naresh for his excellent comedy, which reminds us of his movies of Jandhyala garu. Rahul Ramakrishna has mastered the knack of comedy timing again in this movie after Arjun Reddy. The movie is very self-aware, it takes itself very seriously when it should and not so seriously and laugh with you and at other times, getting you to both be emotionally invested in it and yet entertained by its silliness. The movie is also aided by soulful music by Vivek Sagar who gives his best output since Pellichoopulu and a stellar supporting cast all of whom is given meaty roles and has made their presence every time they are on screen. Nirvana Cinemas is glad to have delivered FOUR back to back hits starting with Anando Brahma, Arjun Reddy, Awe, Mahanati and making it FIVE with Sammohanam. We thank everyone who supported us, especially audience who believe in the resurgence of genuine and honest film-making in the Telugu Film industry. Go catch this cool romantic comedy in this warm summer with your family and friends on big screen. We are sure you will leave the theater with a smile. To further sweeten this Moviepass is enabled for this movie, which means you can watch it for free. And for those who do not have a Moviepass you can utilize $5 deal from Atom tickets using “SUMFUN5” promo code.